JG Lubricant Services is an oil analysis company that offers testing for many different types vehicles and a host of different components including engines, transmissions, differentials, generators, refrigeration equipment (reefer units) and APUs (Auxiliary Power Units). We differ from most other oil analysis companies in that all of our labs are ISO 17025A certified. This means your data and analysis are provided by an oil analysis company that delivers the same quality level and accuracy you’d get from a medical laboratory. As one of the premier US oil analysis companies, JG Lubricant Services offers testing that serves a wide spectrum of industries and individuals. Our oil analysis kit is designed to meet all your equipment maintenance needs and ensures your equipment remains as “worry free” as possible. In an effort to meet all system demands, we have developed and currently market (3) levels of testing including our Basic Oil Analysis Kit, our Advanced Oil Analysis Kit and our Ultimate Oil Analysis Kit. 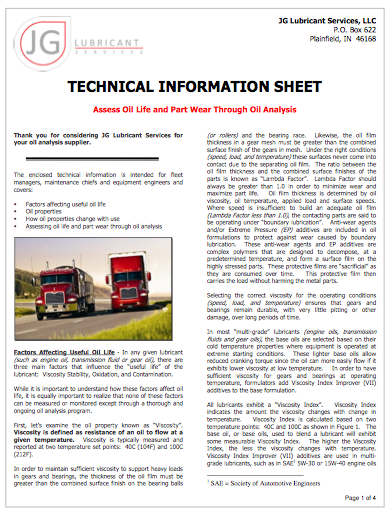 Our oil analysis service and lubricant analysis data give you peace of mind in knowing your equipment is protected through scientifically proven testing and analysis methods. JG Lubricant Services not only offers these tests, but delivers your results within 24 to 48 hours after they reach our labs. Be safe, be smart and use an oil analysis company you know you can trust to give you the information you need when you need it.